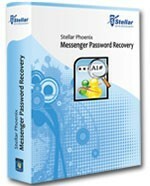 Stellar Phoenix Messenger Password Recovery efficiently recovers lost or forgotten messenger password within seconds. The tool also recovers user name and domain name of the messenger and facilitate the option to save recovered password in text file. Stellar Phoenix Messenger Password Recovery is quick, simple, and efficient utility to recover lost or forgotten password of Messenger applications from various instant messaging clients. The tool very efficiently recovers forgotten passwords, user names, and domain names of the selected instant messenger. Note: The software recovers the passwords of only those messenger applications of which, you have enabled ‘Remember Password’ option. However, the simple and interactive user interface of this tool doesn’t let you feel that you are using this software for the first time. Whether, you are technical or non-technical user, you can use this software very easily. With all these useful features, this software supports recovery of passwords of 40 different messenger applications. Some of the supported messenger applications of this tool are RediffBol, Yahoo, Google Talk, Nimbuzz, Pidgin, MySpace, Chit-Chat for Facebook, Chatterbox, Windows Live Mail Messenger, MSN Messenger, etc. In addition to these features, this very efficient software saves the recovered password in text file. That means, this tool very successfully recovers the lost or forgotten passwords of various messaging applications and let you save the password in text file for later reference. You can save your recovered password in plain text. The software is compatible with Windows 7, Vista, XP, and Server 2003-2008. To evaluate this software, you can download its free demo version. The demo version of the software recovers and shows only first three characters of the password. However, for complete recovery of the password, you have to purchase the license of the software, which bears a reasonable cost. The full version of the software is available in two different licenses, which are license for Single User and Technician license. The Single User license is for single or home users, whereas Technician license is available for data recovery service providers and repair and maintenance companies. 2011-01-01 2.0 not applicable. . .